2011 COLOR TIP 2: Inject a whisper of the complement. 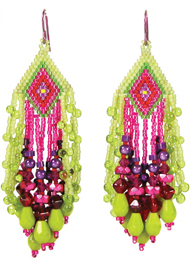 Accents of fuchsia ignite the yellow greens, creating an electric color scheme. Complementary contrasts are the most dynamic contrasts available. If a strict complementary scheme is too bold for you (like the one on the right), thinksmall. Used strategically, a hint of the dominant color’s complement can turn an ordinary palette into an extraordinary delight. Complementary colors sit directly opposite one another on the color wheel. Their harmony provides the most dynamic contrast in hue possible. Successful combinations depend on getting the proportions right. A tiny accent of a complementary can suscitate the weakest color scheme. Too much of one or both complements can collide and pulsate uncomfortably. Balance the contrast by quantity, value and intensity.